Though it is unmistakably Christian, this book has a very Jewish feel to it. There are a lot of do’s and don’ts, like a guidebook down the path of life. There is still debate among theologians who wrote this epistle. It is most widely attributed to Jesus’ “brother” James, who became the leader of the church in Jerusalem – James the Just, not the apostle, (Powell, Intro. the New Testament, p. 445-450). We don’t even know when it was written, whether 60s or perhaps later in the 80s & 90s. Despite the reflection of Jewish Christian traditions, the writing itself suggests a Greek-speaking Jewish community because of its elegance (Perkins, Reading the New Testament, p. 297). What good news do you find in this gospel? How is Christ speaking personally to you in this passage? From John Pilch, The Cultural World of Jesus, Cycle B, 130 -132: The ‘tradition of the elders’ was a set of practices that were defined, maintained, and practiced by elites who lived in the city. The Pharisees wanted everyone to observe this urban tradition. Peasants in the countryside or itinerants like Jesus would have great difficulty observing such traditions. Water was scarce and/or not readily available for such washings. Fishermen and other peasants regularly came into contact with dead fish, dead animals, and other ‘pollutants.’ Peasants had therefore developed the ‘little tradition’ which adapted the requirements of the ‘great tradition’ of the urban and more well-to-do people. Jesus, the artisan (carpenter), obviously sided with this little tradition; he knew first hand the realities and difficulties of peasant life. What we ‘see’ in this gospel is the challenge and retort that was common in Jesus’ day. Questions were rarely inoffensive; every question was a challenge. There was always the hope that the one being questioned would not know the answer. Therefore, they could be shamed. The word, hypocrite, meant actor. In other words, Jesus was saying: “You actors! Scripture may be the lines you quote, but it is not the script by which you live.” It was considered particularly ‘honorable’ to be able to draw creatively and insightfully upon tradition or scripture in the heat of an argument. Some of us Americans are a bit dismayed by Jesus’ ability to confront and insult rather than using tact and diplomacy. Yet, what we see here was how a male would have to respond to ‘make a point’ and maintain his honor. Jesus also changes the topic (another clever refuting skill) by using a parable to teach about what really defiles a person. It is not what one eats that defiles, but what ‘comes out’ of a person that defiles. This is the fourth part of my homily series on the Eucharist. The Bread of Life discourse continues for a fifth week, but my reflection next week will be restricted to going to mass and playing golf in Canada. What is left is to ask why the Eucharist so powerful that it can fill our hungers. From Birmingham’s Word and Worship, p. 617: This small, ragtag military band of Israelites accomplished great victories only because they were sustained and empowered by the Holy One of Israel. Israel laid claim to all of the land because God was the one who helped them secure it in the first place. Salvation history exalts the God who strengthened Israel in all its endeavors – deliverance from slavery and conquest of the Canaanite land. But the inhabitants of Shechem worshiped a god called El-berith. The Israelites worshiped Yahweh. The covenant agreement reached by both groups was to worship the one God, Yahweh. The liturgy in this passage remembers and celebrates the agreement made by the two groups of people. What is it to serve the Lord and claim God as your own? This is deeper than simply professing a belief. As we will see in the Gospel reading, it is a transformation that some simply cannot accept. Not only do we have to choose but we must continue choosing…daily! The Greek root of the word subordinate can be ‘to obey’, or ‘to listen’. Doesn’t that change how we look at Paul’s letter? We must listen to one another, in our marriages and in our church. Notice Paul speaks to the husbands about their responsibilities too, to love their wives. And also note that church is not formally formed yet; he is talking to communities of people bonded in faith. From Barclay’s Daily Study Bible Series, p. 168-174: This reading must be put in context. The Jews has a low view of women at the time. In his morning prayer there was a sentence in which a Jewish man gave thanks that God had not made him “a Gentile, a slave or a woman.” In Jewish law a woman was not a person, but a thing. She had no legal rights whatsoever; she was absolutely her husband’s possession to do with as he willed. And in Paul’s day, divorce was very easy. All a man had to do was to hand a bill of divorcement, correctly written out by a Rabbi, to his wife in the presence of 2 witnesses and the divorce was complete. The only other condition was that the woman’s dowry must be returned. A woman really had no rights to divorce her husband at all. So for Paul to talk about the relationship between husband and wife as being sacrificial, purifying, caring, unbreakable…this was a new idea. And this is carried over into church life. There is an ancient proverb, “It is in the shelter of each other that people live.” How do we do that in our marriages? In our parish? We come to the end of Jesus’ Bread of Life Discourse, but it is with unrest. Murmuring, unacceptance, returning to former ways of life…the disciples are in a similar place as we are now in our Church! With more sexual abuse allegations come to light, the priest shortage and dwindling congregations, we are also a murmuring people who needs consolation. 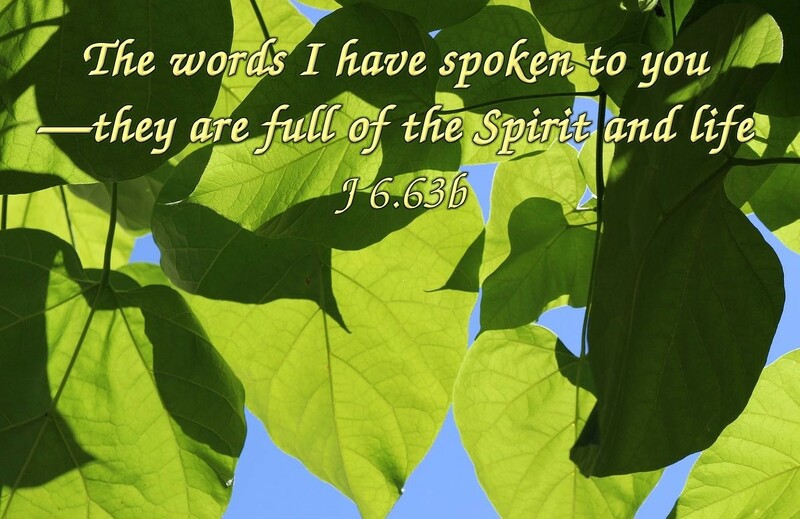 Thankfully Jesus tells us the words we need to hear, those of Spirit and life. Peter affirms his belief in Jesus being the Holy One of God, and yet he denies him later. We are hard to convince. Roland Faley shares, “Faith is attained not by human effort, even though cooperation is essential, but by the action of God drawing the believer.” We must be open to God drawing us in. Perhaps we get in the way of God’s action when we try so hard? Consider the murmurings you have with God in your own life. From Barclay’s Daily Study Bible Series, p. 227: The disciples were well aware that Jesus had claimed to be the very life and mind of God come down to earth; their difficulty was to accept that as true, with all its implications….If we eat simply for the sake of eating, we become gluttons, and it is likely to do us far more harm than good; if we eat to sustain life, to do our work better, to maintain the fitness of our body at its highest peak, food has a real significance…The things of the flesh all gain their value from the spirit in which they are done. Applying this to Eucharist, it makes all the difference. Are we willing to let Eucharist change us, to bring meaning to our life, and to allow Spirit to flow? Can we live so we convince others we are of God too? This was a tough week to be a priest and a tough week to be a Catholic with the repercussions of the McCarrick scandal and the Pennsylvania Grand Jury report. And I hate it when it is a tough week to be a priest because I love what I do and I am sure that you hate it when it is a tough week to be a Catholic because you love your faith. But we need to look at stark reality. For the third part of our series on the Eucharist, let us look for see how Eucharist fills our need for justice and is at the goal of our never ending search for joy. But first let’s define these terms. We all feel the need for justice in our lives. When we are wronged, we want it made right; when we are left out, we want to be included. And knowing we are one body, that sense of justice develops into social justice and is extended to all who are not treated fairly, whose dignity is impugned. Joy of course is that sense that is beyond and greater than happiness which we all know is fleeting. It is a sense of well-being and love that persists despite the circumstances that affect us. In Eucharist, we can have our fill of both.